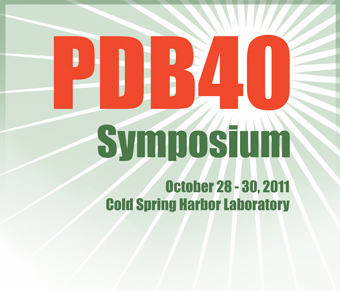 At the end of October, the Worldwide PDB will host a symposium to celebrate the anniversary of the Protein Data Bank (PDB). In its 40th year, the PDB contains more than 76,000 entries that are deposited and used by researchers and students from around the globe. Only a few structures were available in the beginning. October's Molecule of the Month, abstracted here, highlights these early PDB Pioneers. Structural biology was born in 1958 with John Kendrew's atomic structure of myoglobin, and in the following decade, the field grew rapidly. By the early 1970s, there were a dozen atomic structures of proteins, and researchers were discovering that they had a gold mine of information. However, the coordinate files for these structures are quite large, and in the days before the internet, it was difficult for individual researchers to share these large files with the growing number of interested structural biologists around the world. The PDB archive was created to solve this problem. Depositors would send their coordinates to the PDB, who would then mail them to interested users. To celebrate the 40th anniversary of the PDB, you can explore the historic protein structures that inspired the creation of the archive. John Kendrew's structure of myoglobin (1mbn) revealed the folding of protein chains for the first time, and showed how protein chains interact with prosthetic groups and with ligands. Max Perutz's structure of hemoglobin (2dhb) extended this story, showing how four similar chains can associate and regulate the binding of ligands through small changes in shape. The early PDB also included one additional protein from this family. A hemoglobin from lamprey (2lhb), which is intermediate between myoglobin and hemoglobin, regulates its action by transitioning between monomers and dimers. The early PDB also included several structures of enzymes, revealing how protein chains fold to form chemical catalysts. DC Phillips' structure of lysozyme (1lyz), solved in 1965 and added to the PDB in 1975, revealed that enzymes have a form-fitting active site, and with some careful modeling, his group proposed that lysozyme distorts its substrate, making it easier to cleave. Several protein-cutting enzymes were included on the PDB magnetic tapes, including carboxypeptidase (3cpa), subtilisin (1sbt), chymotrypsin (2cha), and papain (9pap), as well as a small inhibitory protein, pancreatic trypsin inhibitor (4pti). The largest structure in the early PDB was the oligomeric enzyme lactate dehydrogenase (6ldh), composed of four chains with a groundbreaking 334 amino acids each.